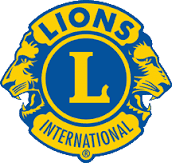 Please reserve Wednesday, May 7th, for the Encinitas Lions Club - "Classic Movie Night" at the La Paloma Theater : "An American in Paris" staring Gene Kelly and Leslie Caron. 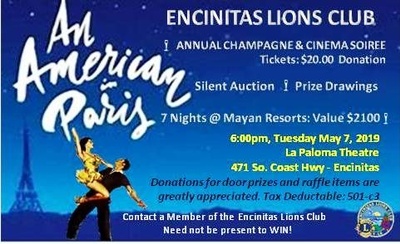 A great fundraiser that gives back to the Encinitas Community. Prize Drawings and Silent Auction. Those activities, free champagne and peanuts, plus a great classic movie make it a wonderful, enjoyable evening. If you would like to market your business at our event, we would be happy to accept your gift certificate, service or product for our raffle or auction. All proceeds go back to the community 100%. Call Dennis or Sunshine at 760-436-0087 for tickets for you and your friends.